This is ancient Greece – but not as we know it. Few people today appreciate that Greek civilization was spread across the Middle East, and that there were Greek cities in the foothills of the Himalayas. This book tells the story of the Greeks outside Greece, such as Sappho, the poet from Lesbos; Archimedes, a native of Syracuse; and Herodotus, who was born in Asia Minor as a subject of the Persian Empire. 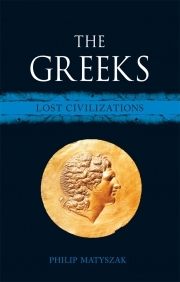 From the earliest times of prehistoric Greek colonies around the Black Sea, through settlements in Spain and Italy, to the conquests of Alexander and the glories of the Hellenistic era, Philip Matyszak illuminates the Greek soldiers, statesmen, scientists and philosophers who, though they seldom – if ever – set foot on the Greek mainland, nevertheless laid the foundations of what we call 'Greek culture' today. Instead of following the well-worn path of describing Athenian democracy and Spartan militarism, this book offers a fresh look at what it meant to be Greek by telling the story of the Greeks abroad, from India to Spain. Philip Matyszak teaches ancient history for Cambridge University’s Institute of Continuing Education. He has written extensively on the ancient world, including Ancient Athens on 5 Drachmas a Day (2008), Greek and Roman Myths: A Guide to the Classical Stories (2010) and most recently Sparta: Fall of a Warrior Nation (2017).